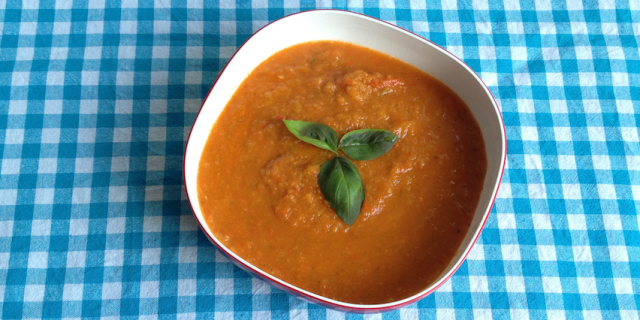 This Sweet Red Pepper Fennel Soup celebrates the flavour of deep caramelised slow roasted veggies. The soup has a lovely sweetness to it. Roasting enhances the naturally sweet flavors of the Roma tomatoes, fennel and bell peppers which browns and caramelizes the veggies. I love this deep, dark caramelization that naturally occurs when you slow roast. It takes almost an hour to prepare but requires only very little food preparation and is so easy to prepare. It’s hands-off cooking at its best. Summer time makes me want to spend lots of time outside and on my yoga mat. But it’s also one of my favorite to be in the kitchen with all those beautiful, freshest ingredients out there. As I love food and as food really is at the center of my being, I don’t want to eat any quick and easy fast food or compromise in any way the taste, flavor or freshness of the foods I eat. Being a busy girl, I had to come up with some ways to cook smart, save time while still getting creative in my kitchen and cooking up beautiful food. One of my favorite ways is slow roasting veggies in the oven. Technically speaking this will take you much longer than whipping up a quick salad or making a veggie stir-fry but this way of cooking allows me to do other things while I am cooking. Add the chopped fennel, peppers, tomatoes, onion, garlic and oregano to a large baking tray. Spreading them out and add plenty of extra virgin oil, mix well into the veggies and season with freshly ground black pepper and sea salt to taste. Roast in the oven for 45 minutes, or until soft and slightly browned. About half way through the roasting process, I usually have a look at how the veggies are coming along. To make sure they brown and cook evenly, I mix them around with a big spoon so the veggies get cooked on all sides and the juices start to mix together even more. When the roasted veggies are ready, add them, along with all those lovely juices from the baking tray to a large saucepan with water and vinegar. Bring to a boil, lower heat, cover and allow to simmer for another 10 minutes. When the soup is ready, I use a hand-held blender to create the desired consistency. I like it to be slightly thick and a bit crunchy. Serve with fresh basil, extra olive oil and black pepper and sea salt to taste.